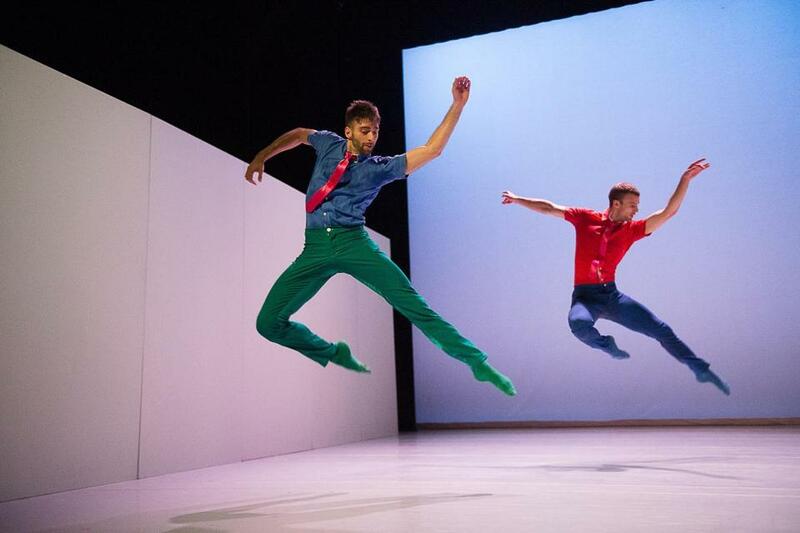 Dario Dinuzzi and Peter Smida of Ballet BC perform at Jacob’s Pillow. BECKET — Ballet BC may have lost some letters when its name was shortened — the acronym stands for British Columbia — but under the artistic direction of Emily Molnar, what the company has gained as it strides into the (to some minds) uncertain future of ballet is tangible and exciting. While Ballet BC still occasionally puts on versions of traditional ballets such as “Giselle,” the program this week is steeped in the genre of contemporary ballet. With nary a balancé or a classical pirouette to be seen in this triple bill of quirky dances, the high balletic ability of these terrific dancers is nonetheless clear. Jacopo Godani’s “A.U.R.A. (Anarchist Unit Related to Art),” though stuffed with steps from the ballet vocabulary, is almost a parody, the movements purposely distorted. Arabesques are jauntily nonacademic, with hips hiking the leg up as much to the side as to the back; port de bras are angled tensely, fingers gnarled, elbows jutting rather than curving. The electronic, percussive score, by 48nord, and Godani’s own sleek, occasionally startling lighting design create an atmosphere of futuristic noir. The dancers perform with a robotic intensity, sometimes shaking their heads as if trying to clear static. Groups enigmatically gather, at times like flash mobs, at others like schools of fish or flocks of birds; solos, duets, or trios form and suggest intrigue but then simply dissipate. All together, this relentless, rather manic coldness could have worn out its welcome, but a subtle wit and the dancers’ commitment to every moment hold us in thrall. There is much angularity and purposeful strangeness in Molnar’s “Aniel” too, but here there’s no missing this piece’s warmly beating heart. Inspired by and set to sections from the composer John Zorn’s “Book of Angels,” the dancers are now goofy Gumby dolls, their stutter-steps or wide inverted pas de chats human, endearingly awkward. Linda Chow’s multicolored costumes underscore the overall theme — a celebration of individuality — while the dancers at times revel in their party-of-one status, at other times in their interactions with others that have the curious and bumbling feel of a first date. They sometimes nervously tiptoe along a wall, like Juliets at the ball. One man shyly ducks under and into the frozen arm of a woman he’s eyeing; alas, when she does take notice she shoots him a “meh” look and walks coolly away. Refreshingly, when sparks fail to fly, these denizens move on, nothing to see here. If “A.U.R.A.” threatened to irritate, Medhi Walerski’s “Petite Cérémonie” could have been too clever: Instead it is an absurd and sublime dance, every component seemingly incongruous yet part of a satisfying whole. Faint strains of arias, bits of Mozart and Vivaldi mingle with Rodgers and Hart. At the beginning of the piece, some of the dancers walk down the aisles with a moving solemnity that isn’t broken even when they clamber and hoist themselves up onto the stage. A dancer juggles, another dances with a palpable yearning while around her a party rages on, the others letting loose physically and vocally. The movement is often spare — there’s a recurring motif of mincing little rocking steps and staccato, Greek chorus-like arm gestures — but requiring an exactitude that this company delivers with unfussy virtuosity. Program notes say that Walerski began by asking the dancers what “life in a box” meant to them. While we see his exploration of the concept — metaphorically in the obsessive repetitiveness, and playfully in the white cubes the dancers sit on or, later, zanily push around like geometric roller skates — we also get his overarching thesis. These dancers couldn’t possibly fit into any box.